Finally one of my dreams has come true: I have a greenhouseperhaps. I bought it for $13.67 at Wal-Mart Saturday night. I prepared it for installation in less than an hour using one tool, a carpet knife. Installation in our garden took five minutes. I’ve oohed and aahed at greenhouses through the years as I’ve leafed through gardening catalogs. Greenhouse kits for “serious home gardeners” range upward from about $700. But, really, I’ve told myself, a greenhouse doesn’t fit well on our hillside lot. And, Frugal Me, I’ve often thought that buying a greenhouse just isn’t too practical for someone who probably won’t be doing “a lot” of gardening 10 years from now. But, yes, I still pause and fantasize when I see a greenhouse in a catalog. Recently I thought that maybe I should “think small.” Why not “build” a very small greenhouse to see how long I can get lettuce to grow in our garden as winter approaches. I’d call it my greenhouseperhaps until I see if it really works. 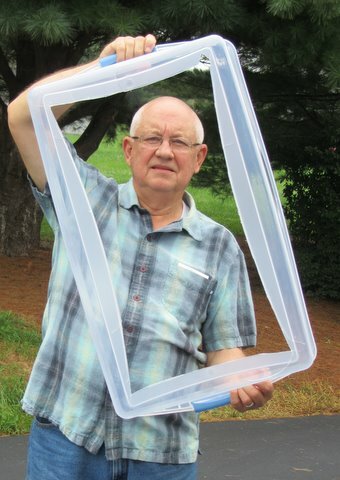 I decided to buy a large, translucent, plastic storage container to serve as my greenhouseperhaps. I’d cut out the bottom, and I could use the top to protect plants growing inside from downpours or even light frosts or snow flurries. At Wal-Mart I surveyed available clear or translucent storage containers of varying sizes. I paid particular attention to heights (so the plants have room to grow) and bottoms (to be cut out so I can plant directly into the garden soil). I chose a Sterilite 105-quart box that is 13 ¾” high by 19 ¾” wide by 83 1/8” long. Price: $13.67. I bought the Sterilite box because I thought the bottom was more soft than rigid so would surrender quickly to my knife. When I began to cut I discovered the going slow because the sides are molded thicker where they meet, though the center rectangle of the bottom is thinner than its edges. I used the carpet knife to cut along the line where the thicker edges met the center of the bottom. This “five-minute job” took nearly 45. The bottom edges that remain will help anchor the greenhouseperhaps. My new greenhouseperhaps is now installed in the garden. 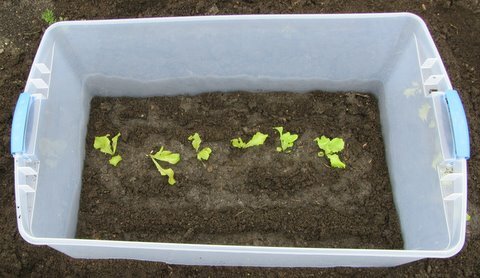 I’ve planted three-week young Simpsons Curled and Red Sails lettuce seedlings in one row and Red Sails seeds in another. 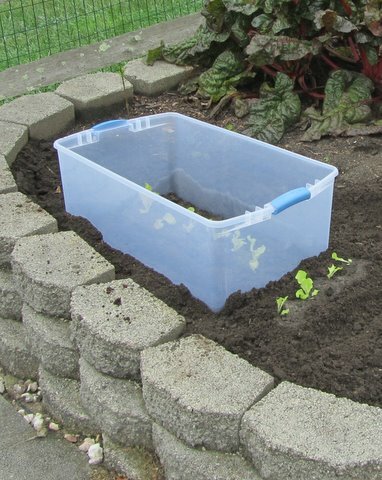 About six hours after I planted the lettuce, dark clouds ushered in a 20-minute downpour and I rushed to put on the lid to protect the transplants. I think the “click handles” will keep the lid in place during fairly strong wind gusts. Will my greenhouseperhaps work? I’ll let you know in a month or two. If it works this fall, I think it should work next spring to grow an extra-early crop of lettuce. I hope my greenhouseperhaps turns into just a plain greenhouse. And to think it cost only $13.67. Perhaps he might have a problem harvesting when the ground freezes. I have been thinking of this idea too, but I want to be able to save my container for other uses too.